It's strange how to similar albums can evoke such different emotions in me. Yesterday I was forcing myself through the rather mediocre album of Impure, and today I feel awed by the violence of the CD by their label mates Nihil Obstat, showing once again that it's sometimes only small details deciding over failure or success. Nihil Obstat are once again a Colombian death metal band, but compared to other bands from South America, they come with the best production yet, making Inherited Primitive Behaviors one hell of a brutal death metal CD, that doesn't have to hide behind the classics of the genre. Instead of opting for simplistic old school clichés or the more melodic European brand, Nihil Obstat chose for the progressive American West Coast sound, something that always works best when the production is top notch, as is the case here. It's hard to pick out any special songs, but the album is just great from beginning to end (except the last song which is a weird soundscape), and even if you feel that with half an hour running time you're a bit cheated, you should remember that the greatest extreme metal albums of all times (Slayer's Reign In Blood, for those of you who might have forgotten) wasn't that long either. 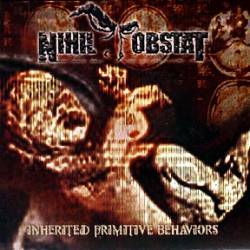 So if you like your death metal not only loud and ferocious, but also with intelligently virtuosic guitar solos and a threatening rumbling rhythm section, then there should be no way past Nihil Obstat's Inherited Primitive Behaviors.